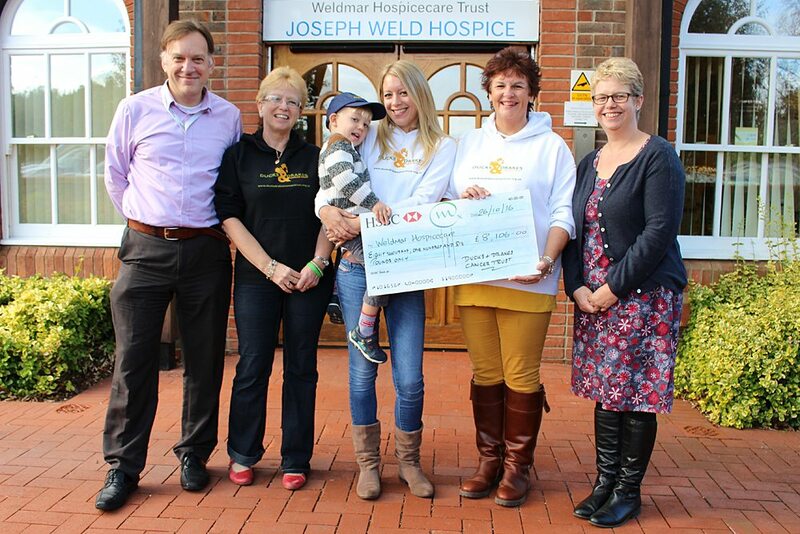 Ducks & Drakes present £8,106 to Weldmar Hospicecare. Weldmar Hospicecare is now able to offer a series of courses, thanks to the support of Ducks & Drakes Cancer Trust – a one day course, suitable for anyone involved in supporting children, young people and their families who are facing bereavement. It is an experiential workshop, which includes theory on bereavement and loss, child development and understanding, communicating bad news, and practical ways of exploring the issues for families and ways of supporting them. Caroline Sweetland, Weldmar’s Lead Education Facilitator, said “We are so very grateful to Ducks & Drakes Cancer Trust for funding this series of one day courses – allowing us to offer them free of charge. We can now hold seven courses between now and 2019. This will allow us to train enough people to support over 2,500 children in this time, and beyond”. By targeting this course to those who come into contact with the bereaved child on an everyday basis, such as teachers and pre-school staff, the child will benefit from the staff being more confident in talking to them about their feelings and will be more able to respond to any emotions which may or may not be expressed. Ducks & Drakes Cancer Trust is based in Dorset and was founded by Andrew Drake and his family following the bowel cancer diagnosis of Andrew when aged 24. Andrew was cared for by Weldmar Hospicecare at the end of his life. Andrew’s family – Annette Drake, Lucas Drake, Rachel Drake and Jane Weeden – recently visited Weldmar’s inpatient unit, Joseph Weld Hospice in Dorchester, to present the cheque for £8,106 to cover the costs associated with providing the course. Annette, Andrew’s mother, said “The Ducks & Drakes find it a privilege to support such a good cause, with Rachel (Andrews wife) having their son Lucas as a three year old. This course will help others with children and grandchildren to understand more, and cope better, with the questions and feelings that children may express especially when they are asked without any preparation”. Weldmar Hospicecare’s Education team run a number of annual courses, study days and other events. For a listing of all the courses available, and more information about Education, please visit their web pages or call 01305 269898.